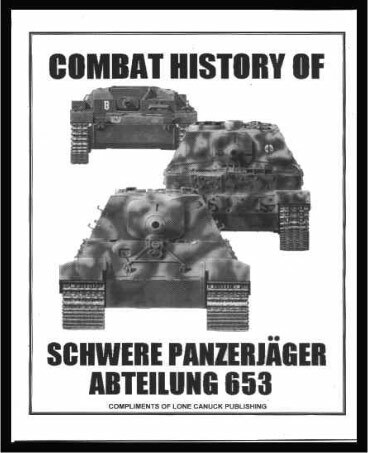 The Combat History of Schwere Panzerjäger Abteilung 653 (SPA), no doubt based on the book of the same name, is a small scenario pack created by George Kelln, but never offered for sale. Instead, he has only made it available to tournament directors who wish to use it as a prize (one of several small packs Kelln has created this way). As a result, it is a very rare ASL product; the only way to get it is to win it as a prize in an ASL tournament, or cajole someone who did so to make photocopies. The 6 scenarios, numbered A-F, include 2 large scenarios and 3 medium-sized scenarios. Four of the scenarios are East Front scenarios, while the remaining two take place in Italy and Germany and actually feature U.S. troops–something very rare for a George Kelln scenario. Three of the scenarios have OBA; one scenario has air support. 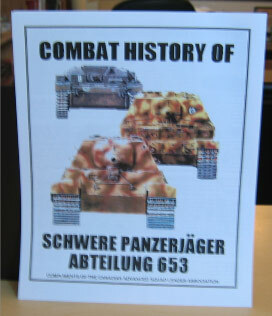 One scenario, SPA-F (Tiger by the Tail), features three Jagdpanzer VI’s (Jagdtigers) with 128L guns and a frontal AF of 26. SPA-A (All-Out Effort) uses a geoboard from Heat of Battle’s High Ground! pack.